The Caring Times, including a quote from Professor Graham Stokes of BUPA. "I've recommended that our care homes purchase A Sense of Calm for both staff and residents to use." Dr. Graham Stokes, Director of Dementia Care, BUPA Care Services. "I have been utilising (the DVD) within one our units on the main wall mounted telly and it has gone down a treat.... I would like all the Managers to be aware of this and be able to purchase it." Caroline Baker, Dementia Services Director, Four Seasons Health Care. Our Senior Managers trialled “A sense of Calm” on pupils with profound and multiple learning difficulties, including two classes for children with severe Autism. The feedback from our staff was extremely positive. They found the DVD not only engaged the attention of pupils, it also calmed those who were over active and in a state of agitation. They also commented how much they liked the quality of the visuals, the speed and flow of the graphics as a sensory aid and the soothing nature of the music. We think the DVD will be a useful aid for both teachers and parents in helping to calm children who have become hyperactive, anxious, frustrated, or attention deficient. Lyn Dance, Headteacher, The Milestone School. “My class team wanted to tell you how effective this DVD has been in class with our pupils. We have a class of seven very profoundly disabled young pupils between the ages of 11 and 14 and we play your DVD at the end of every school day as part of our Reflection time. Without fail, each day, as the DVD begins to play every pupil stills and listens intently to the DVD; those who have vision also watch the plasma screen and are mesmerised by the patterns. I can honestly say that we send the pupils (and staff!) home every day relaxed and chilled due to this wonderfully calming and therapeutic DVD." Annette Fidderman, The Milestone School, Gloucester. 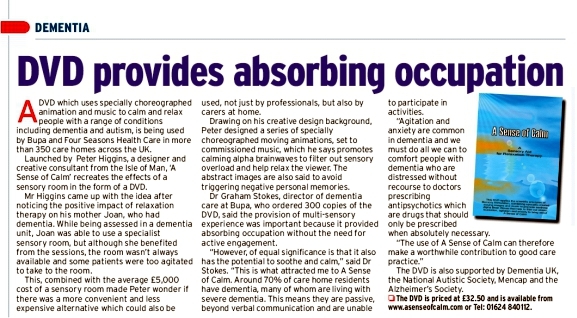 "Initially we trialled the DVD in the Dementia wing, then progressed to the general Nursing wing. As a result of the wonderful calming effect the DVD has, we decided to purchase a mobile sensory unit, promoting the use of the DVD throughout all the wings of the home." Annie Bairstow Matron RN RMN MW. Castle View Nursing Home, Peel. "A Sense of Calm is a very valuable calming tool for certain pupils in my class. It certainly has helped with behavioural and emotional difficulties that some of our young people experience. I would certainly recommend this for that purpose." Adele Devine, an experienced Special Needs Teacher and Managing Director of SEN Assist Ltd.
“He often struggles with the frustration of being unable to communicate and also with hallucinations. This leads to him becoming very angry and shouting for long periods. Now, we simply play the dvd for 15 minutes and we find this is enough to soothe Dad's mind and calm him before his tea or before the nurses do his personal care. I do not know what we would do without it”. Louise Hewish, Family Carer. Tweeted by J. M. Worgan, Mum & Author of 'Life on the Spectrum. The Preschool Years’ & others. Pauline Killey, Special Needs Unit Manager, Peel Clothworkers' Primary School. The DVD continues to be of great help, although may be suffering from overuse! A great asset, thank you. “I purchased a dvd a few weeks ago and have found it invaluable. It is in use almost every day, sometimes twice a day, for my sister-in-law, who has dementia.” Sue Wymer, Family Carer. Maria St. Ledger, BSc Psychology/MSc Organisational Psychology graduate. All content within the A Sense of Calm site is provided for general information only, and should not be treated as a substitute for the medical advice of your own doctor or any other health care professional. A Sense of Calm is not responsible or liable for any diagnosis made by a user based on the content of this website and A Sense of Calm is not liable for the contents of any external Internet sites listed. Always consult your own doctor if you are in any way concerned about your health, or the health of someone you care for. copyright: A Sense of Calm Ltd 2017.